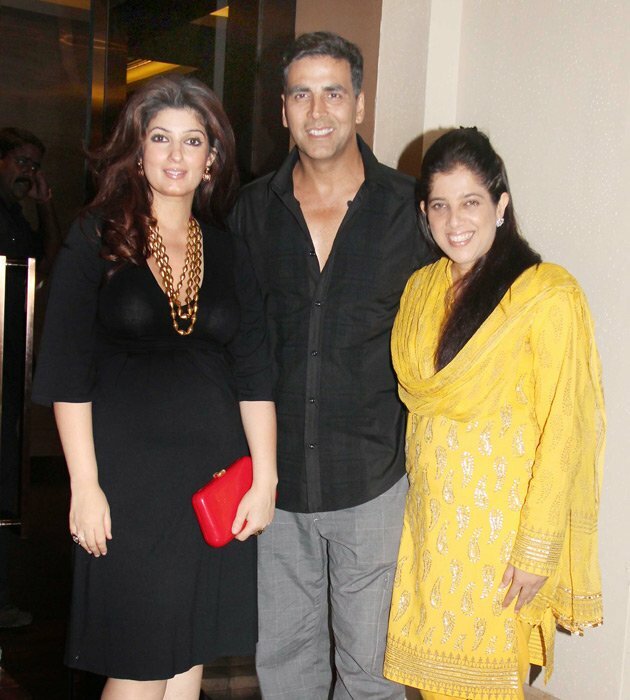 After a long time Twinkle Khanna seen in public with her husband Akshay Kumar at Rowdy Rathore Party. She was Pregant this days so she does not attend party and events but this time she had seen with her hubby Akki. Her baby bump was clearly seen in her black outfit. and Sonakshi Sinha looking stunning in Red Outfit. As we know red color is favorite color of Sonakshi Sinha. She has also looking often in red saree in Rowdy Rathore. It was her Child as "Aarav" is First boy of the couple. Akshay Kumar, Sonakshi Sinha, Twinkle Khanna looking happy with in the party. Rowdy Rathore collection reach at 48 crore in just 3 days. Twinkle Khanna is looking happy becasue she will become a mother second time and another reason is that , a great come back of Akshay Kumar after a series of flop films.